Discussion in 'Personal' started by Scintillant, Jan 20, 2019. I have no doubt things like that happen all over America every day. They have a racist president - why should his supporters be any different. HelenREMfan, FrankWolley, mothorchid and 1 other person like this. There are lots of ignorant, stupid and poorly educated people in America and elsewhere around the World. silkywave and HelenREMfan like this. Thankfully their school has apologised and will be taking some action against these yobs. towncryer, bevdex, chelsea2 and 1 other person like this. Why was a Catholic school bussing schoolchildren to an anti-abortion march in the first place? Why not? Roman Catholics are opposed to abortion. nomad and Timothy_Blue like this. ..and their parents are paying for the privilege of them becoming that way - those boys are from a private male-only Catholic school. Nathan Phillips, interviewed afterwards said he had, "fear for those youth, fear for their future, fear for their souls, their spirit, what they're going to do to this country." Burndenpark, Jamvic, monicabilongame and 1 other person like this. Chanting "Build the wall, build the wall". Pity the native people's didn't do that and keep the likes of this scum out. I note that the American press are making a big thing about Nathan Philipps being a "veteran". So what? I think that is deflecting from the full picture that some privileged a-hole kid thinks he can get away with that behaviour to anyone at all, he sums up the worst divisive aspects of America. silkywave, anotherauntsally, towncryer and 6 others like this. So here is the video of the Indian man approaching the students as they were engaged in their own cheer. And before anyone goes ''Mike Cernovich, urgh alt-rhgt' please note I don't ''follow'' him. If someone came up to a gathering of me and mine, started chanting and banging near us... yeah I'd be impressed that my restraint mustered a ''stare''. vinnie24, Timothy_Blue and artboyusa like this. 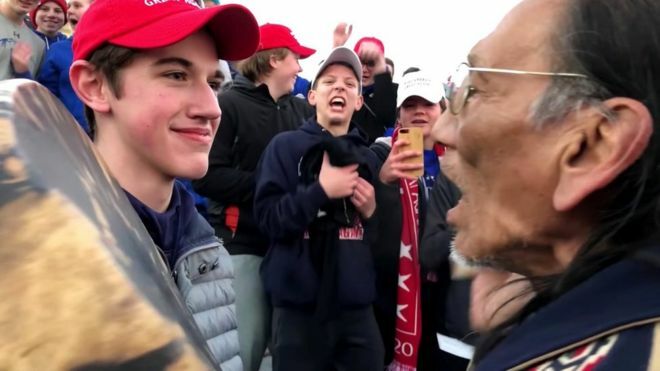 A number of people are now backtracking - it seems Nathan Phillips approached the boys, who did no more than stand there. A full-scale Twitter war has now broken out! nomad and artboyusa like this. I note that the American press are making a big thing about Nathan Philipps being a "veteran". Veterans in Amercia seem to be venerated and seen as heroes - and perhaps should, therefore, be treated better than mere mortals?? [This comment/section has been removed for breaching our Community Guidelines/Terms and conditions] Lanokia! I was going to post those vids. I was going to say that stuff. And now you jump in and take it all away from me. Grrrrrrrrrr…. I must say, it's scary to see again how unquestioning and easily led so many people are. Show them some "news" that reinforces their existing, though unoriginal, opinions and they start drooling like dogs in a Russian laboratory. Mr Phillips gives the impression of being a full time crank and professional victim. Maybe if you've made a personal sacrifice so that others can continue to lead their selfish lives uninterrupted, that deserves, if not veneration, at least some respect. I knew someone would defend it. And there probably have always been. The difference seems to be that now that ignorance is something to be celebrated, something to be proud of. Very depressing. The native americans have a far more intelligent way of viewing the world. They were all but wiped out, condemned to live on reservations by hordes of immigrants and are now mocked for their stance by those who proudly continue to destroy the environment. There really is some kind of correlation at play.